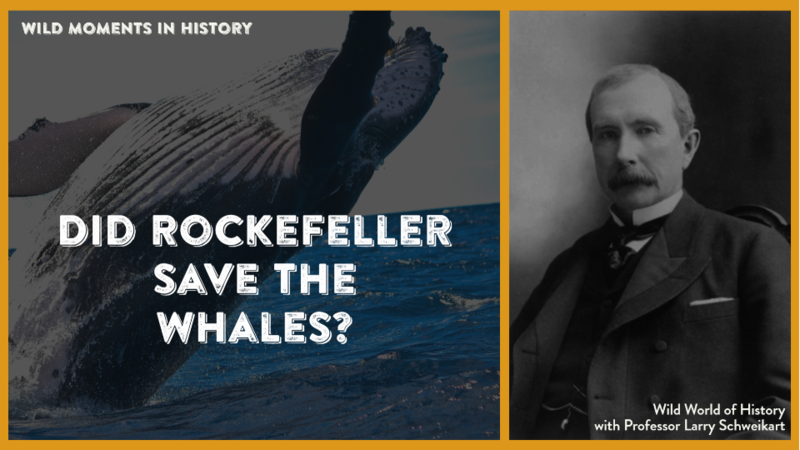 Did you know that John D. Rockefeller saved the whales? Greenpeace has a reputation for “saving the whales,” but Greenpeace is a piker compared to what John D. Rockefeller did. In the mid-1800s, Rockefeller was captivated by a new discovery of oil in Pennsylvania. He employed chemists who successfully refined it into kerosene. But Rockefeller’s incredible gift to America was not just kerosene, but how he had an obsession with lowering its price until it was affordable by an average family. Finding he was spending a lot of money on barrels, “Rocky” started making his own barrels. Seeing that paying other people to transport his kerosene in wagons was expensive, Rockefeller hired his own wagon teams. Later, of course, he laid pipelines to reduce prices even further. And did prices fall! By the late 1800s, kerosene was so cheap it replaced whale oil as the main source of interior illumination. Whale oil prices dropped to the point it was no longer profitable to hunt the large mammals, and whaling dried up as an industry. Although kerosene and oil would have problems of their own—at the time, the biggest concern was fires—nevertheless Rockefeller improved all Americans’ lives, and, of course, got rich doing it. When James Cameron finally gets one of his submersible vehicles down to the bottom of the Mariana Trench, I have expect he will find a giant statue of Rockefeller erected by the whales, and an pilgrimage there by whales to honor the man who saved their species! For further reading, see Ron Chernow, Titan: The Life of John D. Rockefeller, Sr.